Inspire the kids’ interest in Florence’s history, art and architecture on a private, family-friendly 3-hour experience. Enjoy fun activities and treasure hunts as you stroll around the Piazza della Duomo and Piazza della Signoria, and discover Florence’s history in ways that fire the kids’ imaginations. Visit a workshop to see goldsmiths making a ‘florin,’ Florence’s medieval coin; or artisans decorating paper with traditional marbling techniques. A break for an Italian gelato (ice cream) provides an extra, delicious touch. Meet your friendly guide in central Florence, and hear a fun introduction to your experience to get the kids engaged right from the get-go. Then, begin your 3-hour tour with a look around the beautiful Piazza della Repubblica, built on the site of the ancient center of the Roman city. Stroll through the elegant streets to the Piazza del Duomo as your guide tells captivating tales about Florence’s history, art and architecture. Take in the magnificent monuments in the square, including the striped-marble Duomo, Florence’s stunning cathedral. Hear how this vast church was begun in 1296, and get up close to the neighboring bell tower, designed by Giotto in 1334. Look on as the kids search for the simple, hidden decorations on the tower and various characters carved into the Duomo’s façade, all as your guide reveals their mysteries and meanings. Continue through the pretty streets and alleyways to the Piazza della Signoria, Florence’s most famous, statue-lined square. 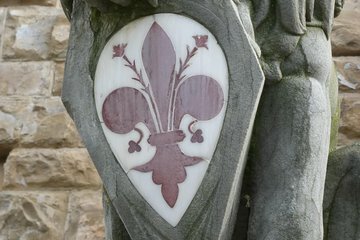 Here, watch as the kids enjoy an exciting treasure hunt around the statues, searching for clues that will feed their interest in medieval Florence and the story of the city’s Medici rulers. Ignite the kids’ enthusiasm for Florence’s arts and crafts with a visit to a workshop to see artisans creating objects synonymous with the city. Peek inside a goldsmiths’ studio to watch craftspeople making a florin, Florence’s medieval gold coin; or visit a paper shop to watch the art of paper marbling, the traditional Tuscan technique of decorating paper. Along the way, take a break at an ice cream shop and savor a delicious Italian gelato. After around three hours, your tour finishes in the city center when your guide says goodbye.